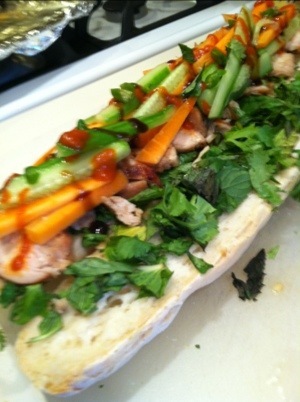 Vietnamese “bun” is a cold sandwich prepared with various proteins like chicken, pork and tofu. 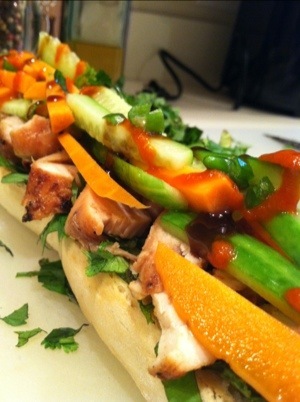 They are all served on a French bread with fresh herbs, peppers, carrots and cucumbers. It’s light, flavorful and very different then the tradition hoagie we are use to. In Philly we have many “bun” shops. They make for a quick and easy on the go lunch. The best part is that they usually cost under $5. Unfortunately, being gluten free makes it impossible to grab one when I want it but this recipe definitely satisfies the craving. First marinade chicken breast with Chinese five spine, salt, pepper, garlic and 1 Tbsp of Korean BBQ sauce. Roast chicken at 500 degrees for 10 min and flip half way. While chicken is cooking give the carrots, pepper and cucumbers a quick pickle by mixing them both in a bowl with the fish sauce and some salt and let it sit for a few minutes. Once chicken is done and cool to the touch, slice thin. The last step is to build the sandwich. Layer the chicken on the bottom, then add the chopped herbs on top and then the pickles veggies. Top it off with the remaining BBQ sauce and sirarcha. Sandwich is large, cut it in half and it makes a great lunch for two. It’s been about four weeks since the final show aired. My life has officially become a roller coaster ride. Every 12 hours some new opportunity or connection happens. Dreaming big and working as hard as I can is really paying off. I am spending any free time I have getting as much experience as possible. 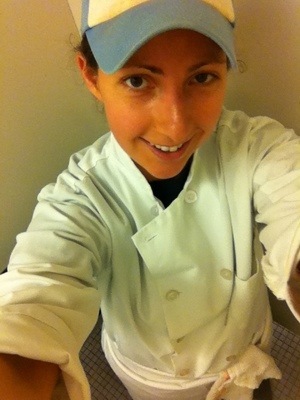 I am interning at a Steven Stat restaurant and learning from some super talented chefs. I am also about to start working with my chef idol Peter McAndrews. 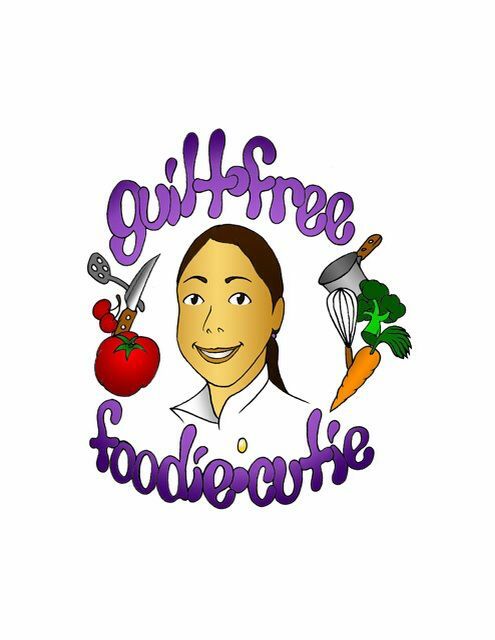 Peter has opened a few very well know restaurants in and around Philly but what many people don’t know is that he makes at least 80% of his menu gluten free and or adjustable. I am really excited to learn from both his artistic approach and gluten free cooking. In addition, I am officially running a gluten free tour of the Italian Market. It will start in July and reservations are highly recommended. The tour will take visitors to many special areas in the countries oldest Italian market. I wrote the tour to show people places that are commonly missed by tourists. Most important, the tour will focus on gluten free food stops. Come hungry!!!! Many more things are in the works. My new segments on NBC start in late July. 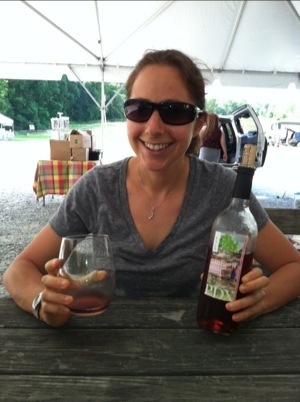 I am writing some great recipes and connecting with many gluten free vendors in the area. 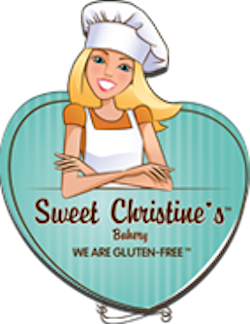 I am hoping to expose people to some great gluten free products that are being produced. Not sure what’s next but possibly a book ;). Water ice the Philly way!!! Second to a cheese steak, Philly is well known for water ice. It is very different from the Italian ice I grew up on. People travel long and far for Philly water ice. President Obama has come to Philly to get some of this sweet treat from my favorite shop down the street. In my guilt free foodie cutie way I have created an easy low cal recipe that can be made at home on any hot day. In a pot bring all the ingredients to a low boil. Simmer an additional 5 minutes or so to reduce to a syrupy consistency. Taste and make sure you reached the level of sweetness you are looking for. Shut the flame and let it cool. For the best result I like to cool the liquid in the fridge over night. But if you want to make it the same day then just add two or three ice cubes and place in freezer for 30 min. Once cool, pour liquid in an ice cream maker for about 30 min or until it reaches the frozen level you are looking for. Serve immediately and enjoy!!!! 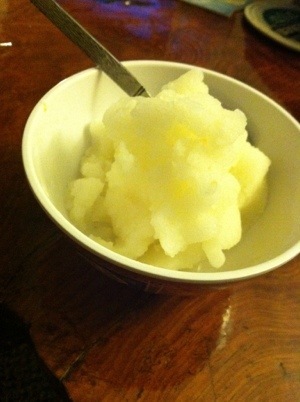 You can use this water ice recipe with any fruit you want. Lime juice and orange juice work great!!! It is important to always use fresh ingredients. I have used watermelon also, just blend about a cup and a half of watermelon chunks and use it in place of the fruit juice and zest. Enjoy experimenting! It is officially summer and I am enjoying using all the seasonal ingredients. 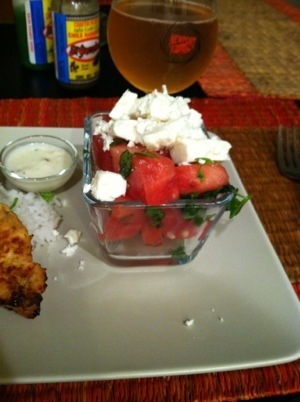 I have started seeing tons of places serving watermelon salad and I love the idea of using fruit in savory dishes. I decided to put my own spin on it. 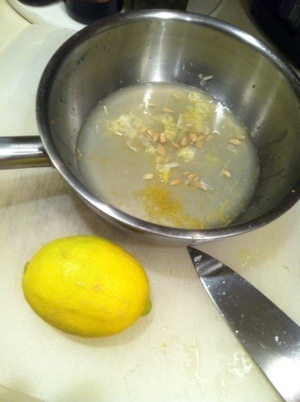 In a bowl whisk together lime juice, vinegar, chopped pepper (seeded), salt and pepper. Pour moisture over watermelon. Then, add the cilantro and mix. Salad is topped with feta when serving. If the cheese sits in the dressing too long it will break apart and dissolve. Salad holds well in the fridge. Add feta cheese before serving. 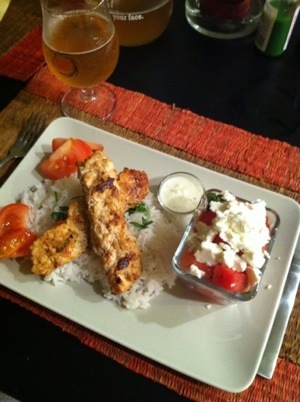 When I made this at home, I was lucky to be able to pair it with an amazing gluten free beer. Before I went gluten free I always enjoyed a good beer. Not many good gluten free versions have been created. In Philly, there is a large number of at home brewers making some fantastic craft beer. 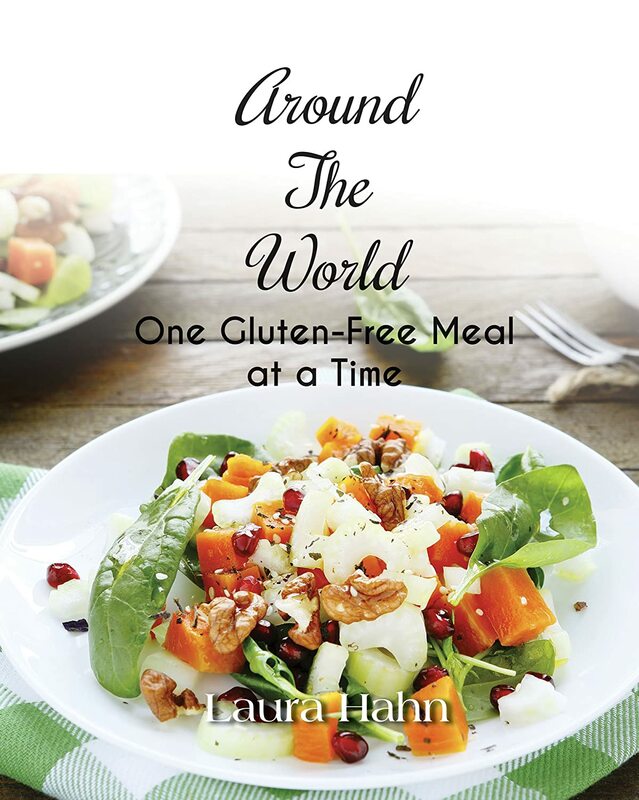 I am very lucky to have a great friend that decided to experiment with a gluten free recipe. When I tried it, I was shocked. It was similar to a Walt Wit which is a citrusy wheat beer. It was light and crisp with hints of orange and spice. I must admit that having a friend really go above and beyond makes me feel very lucky. I am excited to see what he comes up with next and I hope that it will be sold in stores one day for anyone to try. Mediterranean dishes. Kafta kabobs are common in Turkish restaurants. This dish takes a little effort to prepare, but it creates a very unique blend of flavors. I choose to use lean chicken breast but using lamb or beef is also traditional. First place chicken breast in food processor and chop till meat reaches a fine ground cocsistency. Remove meat and place in large bowl. Combine the remaining ingredients except for chick pea flour in the food processor and blend together. Combine the remaining ingredients with the meat in the bowl and add the chick pea flower. Mix well until all ingredients are combined. Form long oval shaped patties 6″ by 1″ on a foiled baking sheet. Cook kabobs on 500 degrees for about ten minutes and then flip. Cook an additional 5 minutes and serve with garlic sauce. I had this at a Lebanese festival in the city and it goes really well with the kabob. Mix all ingredients in food processor and serve. I’ve always been a fan of quick pickling, but chow chow takes it to a whole new level. You get the vinegar flavor, but it is subtle and sweet enough that you might want to take a second portion. Chow chow is actually a very popular item sold in Amish markets. 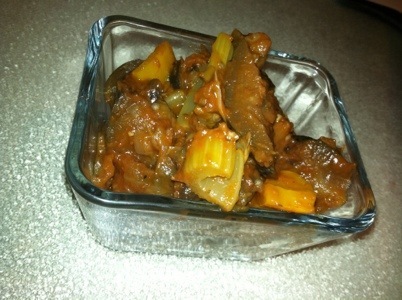 Chow chow is a blend of a lot of vegetables in a vinegar base. It’s a great side to a sandwich or even good used on a salad. Feel free to use anything that you have on hand or any vegetable that looks good at the market. Start by chopping all the vegetables. Blanch* the carrots and cauliflower in a large pot. In another large saucepan combine wine, salt, Splenda and vinegar. Heat liquid to a boil and remove from heat. Once vegetables and liquid have cooled, add both to big storage container. Next, add remaining vegetables and mix gently. Marinate overnight in the fridge and serve cold. * Blanching vegetables is really a work of art. If you can master the technique, then you can make any everyday vegetable simply perfect. The key to perfect blanching is an extra big pot of boiling water and lots of salt. For the best result you do not want the water to ever stop boiling. If volume of water is too low, then the water will stop boiling when vegetables are added. This would increase the cooking time and creates a more soggy product. Use lots of water and small batches of vegetables. The water should also be super salty so that when you taste it, it tastes like ocean water. This is the only time your vegetable will absorb any flavor. Place vegetables in boiling water for about 3 minutes but keep an eye on them to avoid over cooking. Then spoon the vegetables out and place in a large bowl of ice water to stop the cooking process and to retain their natural color. The more ice the better. 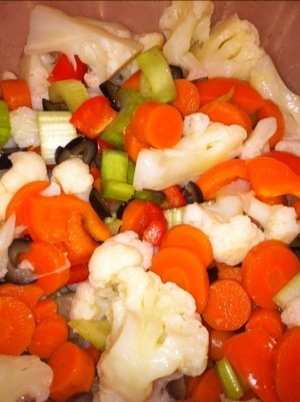 Allow the vegetables a few minutes to cool and then remove and drain. I’m not sure why this is called ratatouille but I love it. My mom would make it all the time and I would eat it right out of the container. Living in the Italian market makes getting the recipe together very easy. 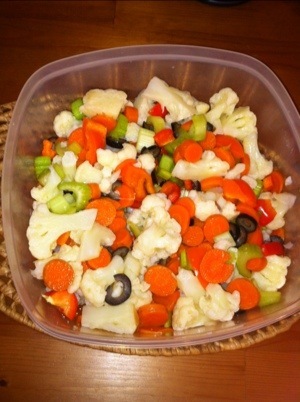 It is a great summer produce recipe. The best part is you can always add whatever you have on hand and use it however you want. Try over pasta, polenta, on a piece of bread or as a side. I changed my mom’s recipe a little to cut some fat bit I promise it taste just as good if not better (sorry mom). First step is to cut eggplant into small cubes and cook on medium low heat in a sprayed large pan. 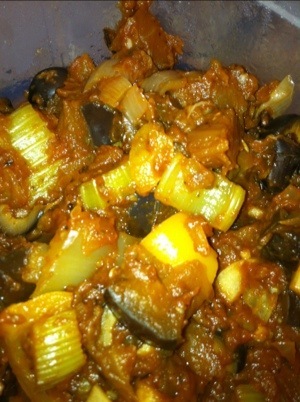 Try to cook the eggplant low and slow to help sweat without using any oil. The oil is absorbed quick so adding it after cooking for a bit help reduce the amount needed to soften eggplant. After about 10 minutes, once a eggplant is soft, add olive oil and continue to cook. Add chopped onion, garlic, bell pepper, wine, vinegar and continue to cook for an additional a few minutes. Last, add celery, olives, oregano, basil and salt pepper to taste and continue to cook the last few minute. Make sure you allow it to cool before storing. Ratatouille is an easy solution for breakfast, lunch or even dinner. Enjoy! This is most likely the only recipe I make at least once a week. It’s the one recipe I wish I could package and sell. Being gluten-free, it’s tough to find bread; it’s either not very good, or it’s very expensive. and started to learn how to make really creative recipes using all the different pulp. 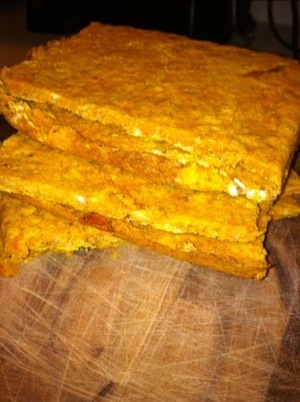 Carrot pulp can be used like any flour. Juice about 2 pounds of carrots to get two full cups of pulp. Add the rest of the ingredients to the pulp and stir very well. 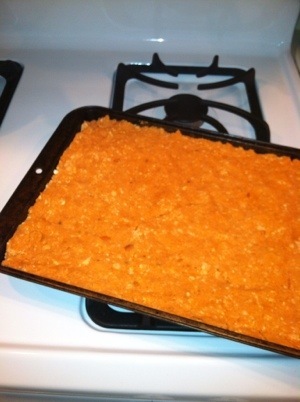 Spread the mixture out on a baking pan (see picture below). Bake for about 30 minutes at 350 degrees. Remove from the oven and allow to cool for at least an hour. Once cooled, cut into approximately 8 pieces to make for sandwiches. I often freeze a lot of what I make by wrapping it with wax paper, stacking it in a Tupperware and put it in the freezer. Give it a try and tell me what your favorite toppings are. I think . When we can’t decide what to have, anything greek is a good option. When summer comes around it’s a safe bet that we have all of this stuff in the fridge. Make a big batch on Sunday and it is a great protein to bring for lunch any day of the week. Put on a salad, or in a sandwich and you’re good to go. 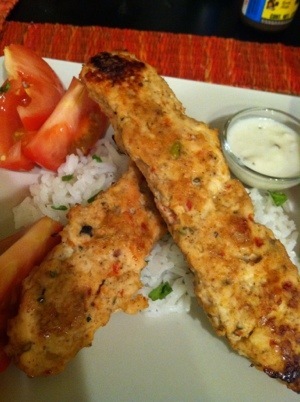 This recipe can be done with store bought falafel mix but I prefer to make my own. Mix all the ingredients together without the chicken to make a falafel mix. Once combined well, coat each piece of chicken with mix. It may be easier to pour mix into a large zip lock and shake. Cook the chicken on a medium flame in a large well sprayed / oiled pan till golden brown and cook completely. This recipe is in my blood. I can understand why buying store made hummus is such a big trend. It’s expensive and has a lot of preservatives. It’s so easy make hummus and to always keep all the ingredients around. Once you get a good base recipe down, that you enjoy, feel free to add whatever you want from pesto, to roasted peppers or anything else. Place all ingredients in food processor. Blend until appropriate consistency is reached. Taste and adjust seasonings as you prefer. I love adding roasted red peppers to the mix for some additional flavor and color. Mix all together and let marinade in fridge for 20 min before serving.